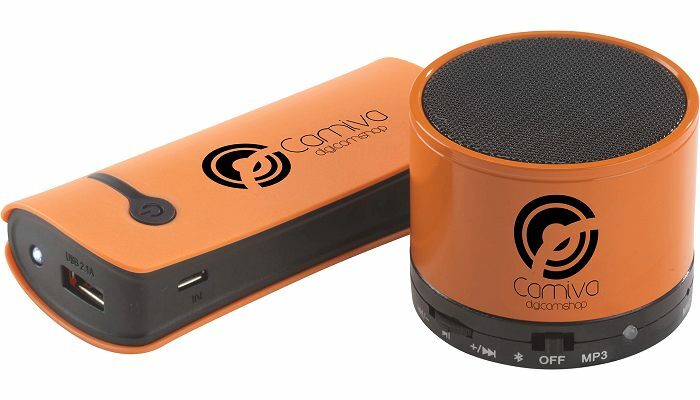 Gift Set of Cylindrical Power Bank & Bluetooth Speaker orange. Gift Set of Cylindrical Power Bank & Bluetooth Speaker white. Gift Set of Cylindrical Power Bank & Bluetooth Speaker black. Gift Set of Cylindrical Power Bank & Bluetooth Speaker blue. 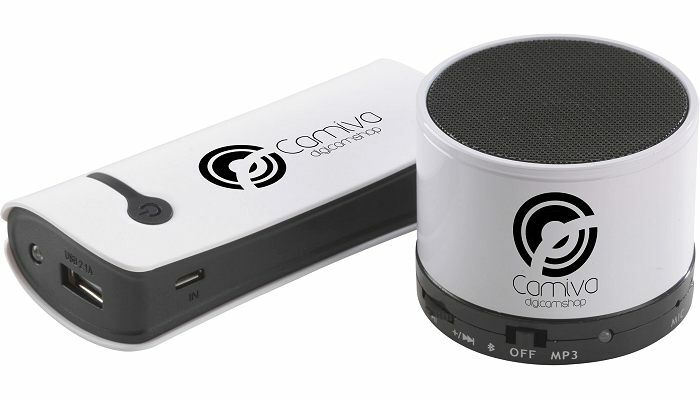 Gift Set of Cylindrical Power Bank & Bluetooth Speaker with black card box lid. 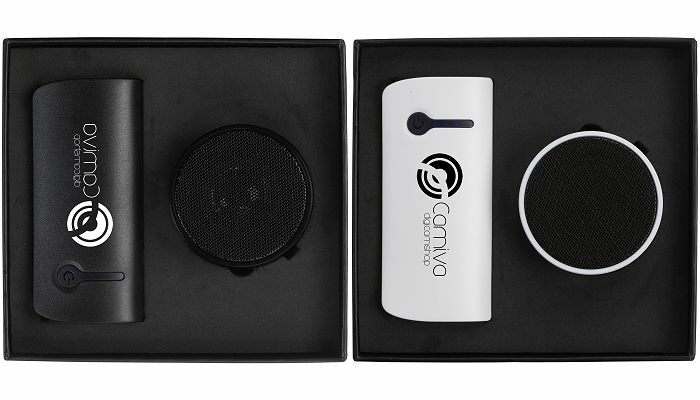 Gift Set of Cylindrical Power Bank & Bluetooth Speaker black and white set top view. 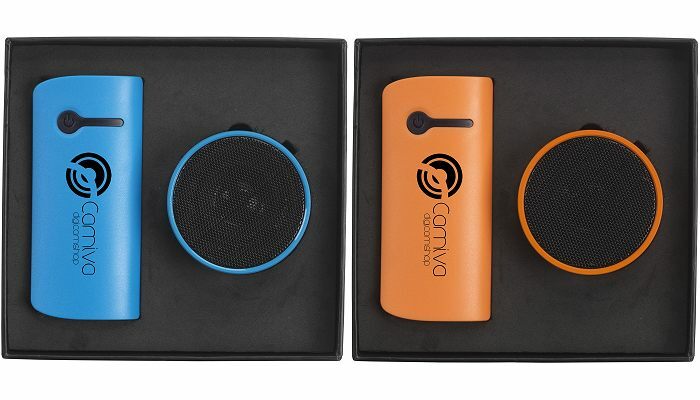 Gift Set of Cylindrical Power Bank & Bluetooth Speaker blue and oranges sets top view. Price includes your logo printed in one colour in one position. Delivery and VAT extra. 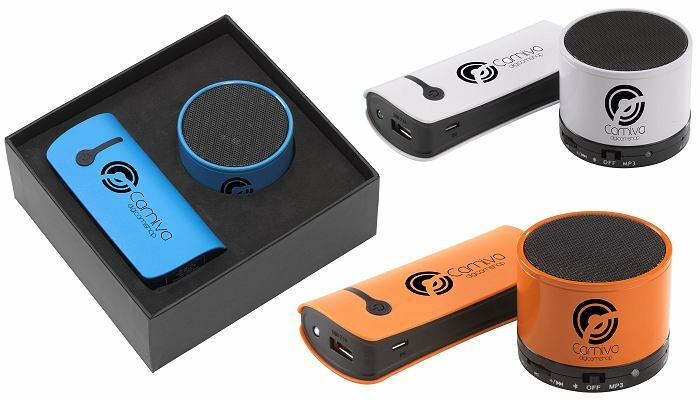 A boxed logo branded gift set containing a 4000mAh power bank and a bluetooth 3.0 speaker each with your digitally printed logo. The Power bank is a compact emergency charger with battery indicator light and torch light function. 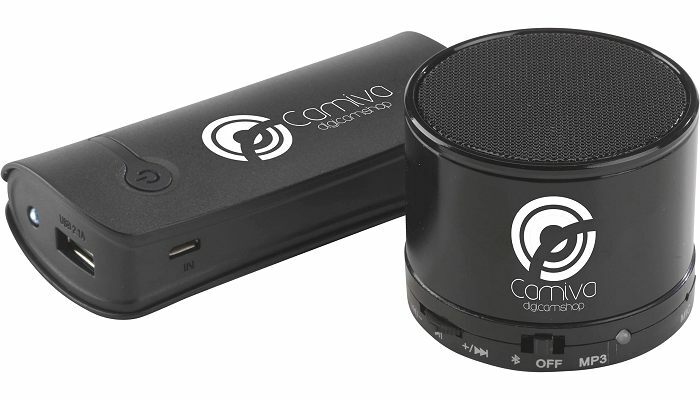 The rechargeable wireless mini speaker with Bluetooth version 3.0 is in a metal housing, with excellent sound quality. Its frequency response is from 200Hz to 20Khz with power output of 3W. 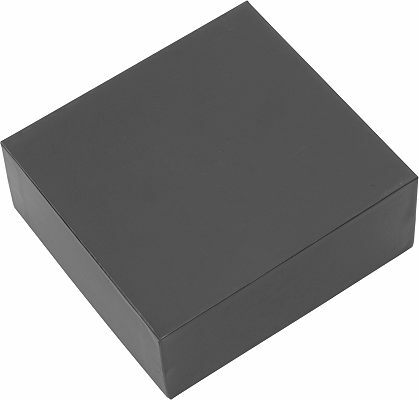 Easy to operate and suitable for the most popular mobile devices and tablets. Also suitable for SD cards. It includes a USB / Audio cable (approx. 51 cm) with standard 3.5 mm plug, rechargeable battery and instructions.